The photo browsing, viewing, and sharing features of 3DComposer are permanently enabled. The 3D photo creation and editing features are available to new users on a trial basis, but a license is required to enable them permanently. If you purchased 3DComposer in a retail package, license information is included in the printed materials within the package. If you downloaded 3DComposer from the web, you’ll need to buy a license online. 3DComposer supports several licensing options, so you can choose to simply buy the full version or buy only the features you need. The Creator license enables all 3D photo creation features. The Editor license enables all 3D photo editing features. The features enabled by each license are shown in the table below in the 3DComposer Main page. After installing 3DComposer for the first time, the program starts in trial mode, where all features are available. Trials of the creation and editing features run independently. The creation trial runs until 15 3D photos are created. Creating 3D photos from the provided sample pictures does not count against this limit. The editor trial runs until 10 3D photos are saved. When each trial expires, the features that are not found in the other trial are disabled until the proper license is activated. Both trials also expire if no licenses are activated within 60 days of installation. If you have not licensed the full version of the program, an option for buying a license is presented under the Help menu. All available licenses can also be found in the 3DMedia online store at http://3dmedia.com/store/. After buying a license, you should receive an email containing a “Digital Rights” code and a Password. To activate the license, start 3DComposer, choose the menu item Help -> Activate License, and enter these codes in the License ID and Password fields. Unless you choose otherwise, the installer puts a shortcut for 3DComposer on your Desktop. You can double-click the shortcut icon to start the program. You can also start the program via the Start menu, under Programs -> 3DMedia. When 3DComposer is started using these methods, the window containing the folder browser and thumbnail viewer opens. 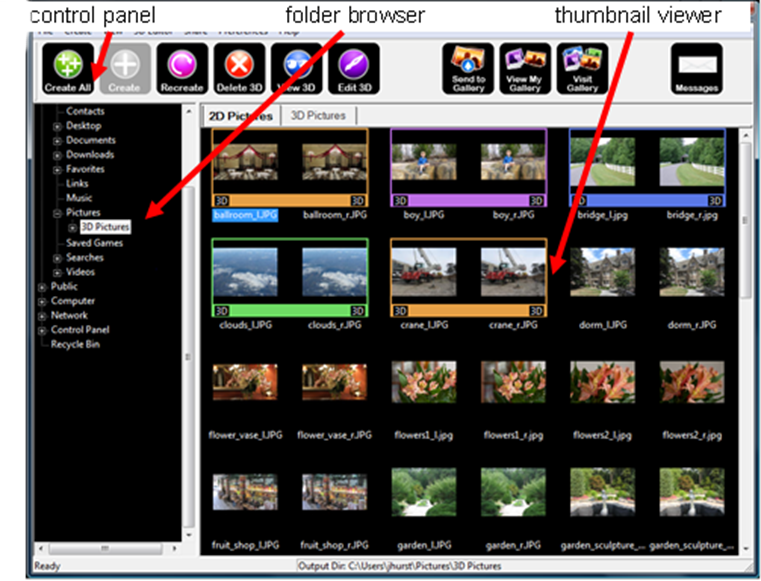 The main window consists of three panels: the control panel, the folder browser, and the thumbnail viewer. For ease of reference, this entire window is called “the browser”. The folder browser is used to navigate to the folder containing the 2D or 3D pictures you want to work with. Note that 3DComposer does not support creating new folders from within the browser. If you make any changes to the folder structure from within Windows or some other application, you can execute File -> Refresh from the control panel menu to refresh the browser. The thumbnail viewer shows “thumbnail-sized” versions of pictures within the folder selected in the folder browser. The thumbnails are listed in alphabetical order. You can control the thumbnail size using the options under the Preferences menu in the control panel. 2D pictures must be in JPEG (JPG) format to be shown in the thumbnail viewer and used to create 3D pictures. The supported 3D picture formats are MPO and JPS. If the selected folder contains only 2D pictures or only 3D pictures, all pictures are shown. If the selected folder contains both 2D and 3D pictures, tabs labeled “2D Pictures” and “3D Pictures” are displayed at the top left of the thumbnail viewer. Click on one of these tabs to show that picture type. If the selected output directory contains a 3D picture that was created from a pair of 2D pictures, these 2D pictures are shown with a colored box around them that is labeled “3D”. Such 2D pictures are then called “source pictures”, and they can be selected for 3D operations such as viewing, editing, or sharing. The control panel contains the menu of available functions. For faster operation, a tool bar is provided that contains buttons for the most commonly used functions. Alternately, you can right-click the mouse within the thumbnail viewer to show a menu of available functions for the selected picture(s), then select the one you want with the left mouse button. An instruction bar appears below the control panel. It explains how to perform the most common tasks, depending on what you have already done. The instruction bar can be disabled by clicking the “Close” button on its left side, and can be enabled or disabled from the Preferences menu. At the bottom of the browser window, a status bar shows the program status, including the Output Directory setting for 3D photo creation. It also reminds you if you have chosen non-default settings for Depth Adjustment or Use Right Picture First in the Creation Settings. Many functions require pictures to be selected in the thumbnail viewer. Selected pictures are indicated by a blue box around their filenames. A 3D picture can be selected by finding and selecting its two-image thumbnail or by selecting either of its source pictures (the 2D thumbnails with colored boxes around them). This allows you to work on 3D pictures without leaving the 2D Pictures tab. Picture selection is controlled using the following mouse and keyboard actions. These actions follow conventions used by many programs, so operation should be easy to learn. Open the picture in the associated viewer. For source pictures, the created 3D picture is opened. You can use 3DComposer to create 3D photos from pairs of 2D pictures taken with any camera. Don’t let 3D camera owners have all the fun! The following list provides an example of the entire 3D creation process. 1. Take some pictures with your current camera. Some will be picture pairs intended to become 3D, but some can also be single 2D pictures. If you haven’t learned the techniques for taking 3D pictures, please read the section called Taking Pictures for Use with 3DComposer. 2. Import all pictures from the camera onto your computer. 4. Use the folder browser window to select the folder where the imported pictures are stored. They should then appear in the thumbnail window. 5. Click the “Create All” button on the control panel. 3DComposer automatically identifies all pictures that are left/right pairs and uses them to create 3D pictures. When all 3D pictures are created, close the pop-up window that showed the creation progress. The picture pairs that have been used to create 3D pictures are marked with boxes of the same color and the label “3D”. The resulting 3D picture files are now in the directory you specified under Preferences. By default, this is the same directory as the 2D pictures; you can verify this by checking the status bar. 6. If there are picture pairs that you expected to become 3D pictures but they weren’t used, select a pair of these pictures (one way to select pictures is to click or Ctrl-click on a thumbnail image). Then click the “Create” button on the control panel. Repeat as necessary to create 3D pictures from all picture pairs that were intended to be 3D. 7. To view your 3D pictures, first make sure the 3D Display Mode is set properly for your monitor (under View ->Viewer Settings), then click the View 3D button. You’ll need to wear the glasses appropriate for your monitor type to see the pictures in 3D. Once the 3D viewer starts, you can start a slideshow of all 3D pictures within the selected directory. The characteristics of the created 3D pictures are controlled by several settings under the Create -> Creation Settings menu. File Type: Choose the file format used to store created 3D pictures. Your choice should depend only on which one is supported by your 3D viewing application. The 3DComposer viewer supports both formats, so the choice doesn’t matter if you are only using this 3D viewer. If you’re not sure, leave this setting at the default of MPO. · MPO: “Multi-Picture Object” format containing multiple JPEG images with respective thumbnails and metadata. · JPS: “JPEG Stereo” format consisting of side-by-side JPEG images. Use Right Picture First: When taking 3D pictures, you should normally take the left picture first, that is, move the camera to the right between the two shots. However, this option can be used to create 3D pictures when the right picture was taken first. Resolution: Choose the resolution of created 3D pictures. · Full: Create 3D pictures with approximately the same resolution as the 2D source pictures. This is the default option. It takes more time, but results in more detailed 3D pictures. It is recommended for most PC monitors and for storage of 3D pictures with no loss of resolution. · HDTV 1080: Create 3D pictures with a resolution of N x 1080 pixels, where N is chosen to match the aspect ratio of the 2D source pictures. This size is ideal for viewing on 3D HDTVs. · HDTV 720: Create 3D pictures with a resolution of N x 720 pixels, where N is chosen to match the aspect ratio of the 2D source pictures. This size yields the fastest results, and is recommended for lower resolution displays, including some photo frames. Wide Screen (16:9 Crop): This option is independent of the resolution options. If selected, 3D pictures are created with an aspect ratio of 16 by 9 instead of matching the 2D source pictures. This creates pictures that completely fill wide-screen displays such as HDTVs and some PC monitors. Note that many cameras take pictures with aspect ratios that are narrower than 16:9. For example, 4:3 is common. In these cases, a portion of the original content is cropped from the top and bottom to create the 3D picture, as shown in the following diagram. This cropping may yield unacceptable results for some photos. Jpeg Encode Quality: Controls how much compression is applied when creating 3D pictures. Higher numbers mean higher quality, but also larger file sizes. The default setting is recommended for most applications. Depth Adjustment: Controls the amount of depth in created 3D pictures. Adjusting the depth means that objects seem to move closer or farther away. The default setting of 0 is recommended for most applications, but you may want to change it based on your preferences and tolerance for depth in 3D pictures. The settings under the Create -> Output Directory menu control where the 3D pictures you create are stored. Same as Input Directory: 3D pictures are created in the same folder as the 2D pictures. This is the recommended setting, as it is usually the easiest to organize and maintain. Set Output Base Directory: 3D pictures are created in a subdirectory of the base directory you choose. The subdirectory is named the same as the currently selected directory in the folder browser. For example, if you choose a base directory “All 3D”, then browse to a directory “My Pictures” and create 3D pictures there, they are stored in a directory called “All 3D/My Pictures”. This directory is created if it doesn’t already exist. If you don’t specify the base directory, the default is “Documents/3D Pictures”. This option helps to preserve file organization when 2D pictures from multiple directories are processed. Set Output Directory: 3D pictures are created in the exact directory you specify. This option is useful if you want all your 3D pictures to be stored in the same directory. The Create menu contains the functions that create 3D pictures from pairs of 2D pictures. All creation functions launch a progress window that shows the results. At the end of the creation process, any two 2D pictures that have been identified as a 3D pair are outlined with a box of the same color that says “3D”. This means that a 3D picture file now exists for that pair. The resulting 3D pictures are created in the output folder you have chosen, which is shown in the status bar at the bottom of the window. This is a single-step process that identifies 2D picture pairs that can be used to create 3D pictures, then creates them. By default, all pictures are processed; however, if pictures are selected, the process is restricted to only the selected pictures. 2D pictures that already have 3D pictures associated with them (source pictures) are skipped. It is assumed that 2D pictures intended to be paired for 3D creation are named sequentially and are therefore adjacent in the thumbnail viewer. This should be the way picture files are named by the camera if the right picture was taken immediately after the left one. This function forces the program to try to create a 3D picture from the selected 2D pictures. It requires that two 2D pictures are selected that do not already have a 3D picture created for them. This can be useful if Create All fails to create 3D for two pictures that you think should be valid left/right pair. This function creates multiple 3D pictures for the selected 2D pictures such that the first 2D picture is the left picture while all others are right pictures. It requires that more than two 2D pictures are selected that do not already have 3D pictures created for them. After 3D creation, the source pictures are labeled to identify their relationships. Further operations on these pictures work the same as with any 3D pictures, but note that the right pictures are associated with a single 3D picture, while the left picture is associated with all the 3D pictures made from it. This feature makes it convenient to take multiple right pictures of a subject with varying stereoscopic bases so you can wait to choose the depth of the final 3D picture after creating multiple versions. You could take these pictures manually, or you could use a series of shots taken with a camera that provides a “burst capture” or “continuous shooting” mode. This function is similar to Create All 3D Pictures, however it only operates on selected 2D pictures that already have 3D pictures associated with them. It is mainly useful for recreating 3D pictures with settings that are different from the ones you have chosen in the Creation Settings menu. When this function is executed, a menu of options similar to the ones under Creation Settings is presented, but they are not stored for future use unless you choose the option Save as Defaults. The previously created 3D picture files are overwritten. One use for this function is to correct for 3D picture pairs taken by moving the camera to the left between shots, and may generally be useful when it appears that the default left/right selection has produced the wrong result. 3D pictures created with this option are marked in the thumbnail viewer with the text “Right” and “Left” to indicate the reversal. The reversed setting persists until the 3D picture is deleted or recreated with the left picture first. · Valid picture pairs do not have consecutive file names and therefore are not adjacent in the thumbnail viewer. Such pairs can be processed individually by selecting the two pictures and pressing the Create button. · Occasionally, valid picture pairs cannot be automatically identified using the Create All button (Create All 3D Pictures function) due to certain complex features of the pictures. Such pairs can be processed individually using the Create button. · The resulting 3D picture quality is found to be objectionable due to too many differences in the two pictures. Care should be taken to follow the guidelines for taking 3D pictures. For more information, see the section of this guide called Taking Pictures for Use with 3DComposer. 3DComposer lets you view 3D pictures on your PC using several kinds of displays. · NVIDIA 3D Vision® - Your PC includes NVIDIA’s 3D Vision system and is connected to a monitor that supports it. You’ll use the active glasses that came with the system. · Interlaced - Your PC is connected to a monitor that displays 3D by interlacing the pixel rows of the left and right images. You’ll use the passive glasses that came with the monitor. · Side-by-side or Top-bottom - Your PC is connected to a monitor that has a 3D mode that accepts input in one of these half-resolution formats. This is a common choice for 3D TVs. You’ll use the glasses that came with the monitor or TV. · Anaglyph - Your PC is connected to a monitor that has no 3D capabilities. You’ll use red/cyan anaglyph glasses. If you purchased 3DComposer in a retail package, a pair of anaglyph glasses is included. Note that the quality of the viewing experience in anaglyph mode is vastly inferior to the other modes. 3DComposer can display 3D pictures that are stored in either MPO or JPS formats. Unless you choose otherwise, the 3DComposer installer makes 3DComposer the default viewing program for 3D pictures with file types MPO and JPS. This is highly recommended. Therefore, 3DComposer can be started in 3D viewing mode by opening one of these pictures from within Windows Explorer (for example, by clicking or double-clicking its icon). Before viewing 3D pictures, select your display setup and choose your viewing preferences by selecting View -> Viewer Settings. 3D Display Mode: Select an option according to the type of display device you’re using. For more information, see descriptions of the supported displays at the top of the Viewing 3D Photos section. Swap Left/Right Eye Views: Always reverse the left- and right-eye views when viewing 3D pictures. Selecting this option is not usually appropriate, but it can be used if you find that your monitor expects the image order to be the reverse of your 3D pictures. Monitor Selection: If your PC is driving more than one monitor, you may choose “Monitor 2” as the destination for 3D viewing. For systems with only one monitor, “Monitor 1” is the correct choice. Slideshow Interval: Select from the available list how long the viewer waits between pictures when a slideshow is running. Note that if your PC is connected to an external 3D monitor or TV via HDMI, getting 3D display to work requires correct settings in the PC’s display control panel and in the monitor’s setup menu. For example, the PC must be set to drive a resolution that the monitor can receive (1920x1080, or “1080i” should usually be a good choice). The monitor must also be put into the 3D display mode that matches the 3DComposer setting (for example “side-by-side”). Setup and viewing are usually easier if you define the external monitor as an independent “Monitor 2” in the display control panel and in the 3DComposer viewer settings. The View menu contains functions that initiate the viewing of your 3D pictures. View the selected 3D picture(s) with 3DComposer. As always, 3D pictures can be selected by clicking on 3D pictures or 2D source pictures in the thumbnail viewer. If a single 3D picture is selected, this function opens it in the viewer. Double-clicking on a 3D picture has the same effect. If no pictures are selected, a slideshow starts, showing all 3D pictures in the selected folder. If multiple pictures are selected, the slideshow includes only the selected pictures. View the selected 3D picture with whatever Windows finds to be the default application for opening MPO or JPS files. This could be 3DComposer, but you may decide to associate a different viewer with these file types. If any 3D pictures are selected, the first one selected is opened for viewing. If none are selected, the first one in the thumbnail viewer is opened for viewing. View the selected 2D picture with whatever Windows finds to be the default application for opening JPG files. Note that 3DComposer can’t be used to view 2D pictures. If any 2D pictures are selected, the first one selected is opened for viewing. Double-clicking on a 2D picture that is not a source picture also opens it for viewing. 3D pictures are displayed in a full-screen viewer window. If your 3D pictures are higher resolution than your monitor, they are displayed so they fit the monitor as well as possible. However, if a picture is lower resolution than your monitor in both the horizontal and vertical directions, by default it is displayed at actual size, not zoomed to full-screen. An information bar at the top of the viewer window shows the file name of the currently displayed picture as well as its position in the sequence of all pictures in the current folder. Below this bar are several buttons which control the viewer functions. The information bar and all buttons disappear if you don’t move the mouse for a few seconds. They reappear when you move the mouse, and stay onscreen if you leave the pointer on them. The viewer functions are described below. Minimize the viewer window and open or return to the browser. View the 3D pictures you have shared in 3DMedia’s online 3D Photo Gallery. You must be logged in to the gallery to view your pictures, so this function takes you through the steps to log in and select the album you want to view. Open a menu of 3D editing functions to alter the currently viewed picture. The editing functions are explained in the section Editing 3D Photos. Delete the file that contains the current picture. This is the same as pressing the Delete 3D button in the browser. Start or stop a slideshow of all pictures in the current folder. When this button is pressed, its name and function changes between “Start” and “Stop” as appropriate. View the previous picture in the folder, as sorted by file name. This command is also triggered by the left arrow key. View the next picture in the folder, as sorted by file name. This command is also triggered by the right arrow key. Display the list of keyboard shortcuts. Press the Help button again to hide this list. The F1 key on your keyboard is the same as the Help button. Open the Viewer Settings dialog. These are the same settings that are available from the browser. Exit the viewer without returning to the browser unless it was already open. Pressing the Escape key at any time also exits the viewer. Several viewing functions are available via the keyboard. Some are the same as the buttons, while others can only be triggered using the keyboard. All keyboard functions are listed in the table below. The 3D photos created by 3DComposer can also be viewed on 3D-capable displays other than PC monitors. The requirements are a 3D-capable electronic display and a 3D photo viewer program to drive it. Some examples are described below. More products with 3D displays are being released regularly, so this list is not comprehensive. 3D TVs are arriving in the market at a rapid pace, providing an excellent way to view 3D photos on a big screen. Some 3D TVs, such as those in the Panasonic Viera® and LG Infinia™ series (and later), contain an application for viewing 3D pictures (MPO files) on a supported external storage device such as a USB drive or SD card. If your 3D TV doesn't include a 3D photo viewer, you can use one on an external device that connects to the TV with an HDMI cable. If your PC has an HDMI port or any video output port that can be adapted to HDMI, you can connect it to your 3D TV and use 3DComposer’s viewer as described earlier in this guide. The Panasonic DMP-BDT series of 3D Blu-ray players can also play back 3D photos stored on optical media, USB drives, or SD cards. Other TV-connected devices that can display 3D photos are available, and more will surely be coming soon. Note that all DLP-based HDTVs should be 3D-ready, and a large number of them are already in homes (mostly made by Mitsubishi and Samsung). These TVs require an external device to send the 3D pictures via HDMI as mentioned above. · The Nintendo 3DS™ gaming system can import MPO format 3D pictures and display them on its screen for 3D viewing without glasses. · Phones such as the HTC EVO™ 3D and LG Optimus™ 3D support 3D picture viewing without glasses. 3DComposer provides an editor that lets you adjust many aspects of your 3D pictures. Your edits are only saved when you choose one of the Save functions, so you can make changes without commitment. The editing functions are accessible from within the viewer. To enter edit mode, select a picture in the browser and press the Edit 3D button, or press the Edit button from within the viewer. The editing functions are described below. Note that you can move the edit menu by clicking on its header and dragging it to another location. This function realigns the left- and right-eye views of the 3D photo to try to improve the quality of the 3D effect. This can sometimes improve the quality of 3D photos taken with 3D cameras. Note that this function should not be used on 3D photos created with 3DComposer, because it won’t yield improvements and may crop your picture. After pressing the Optimize 3D button, you can select Undo/Redo to compare the before and after versions, then keep the original or accept the optimized picture. Note that the Optimize 3D function can only be used before any other editing functions. This button is disabled if any other edits are performed first. This function reverses the left- and right-eye views of the 3D picture. If the depth of a picture appears distorted or it’s unpleasant to view for any reason, the left and right images might be reversed. Press this button again (now labeled Unswap L/R) to change the views back to their original state. This function lets you crop your 3D pictures to the desired size. First, select the desired aspect ratio from the list. Next, resize and reposition the crop box by clicking and dragging any of the white squares on it. After making adjustments, you can choose to preview the crop, or just accept it. Note that if you crop the picture to a resolution that is larger than your monitor, after cropping the view zooms to fill the screen again. If you crop the picture to a resolution that is smaller than your monitor, the cropped picture is shown at its actual size. This function lets you adjust the apparent depth of your 3D pictures. To adjust the depth, click and drag the slider or use the mouse scroll wheel. Note that large depth values are rarely needed to achieve the best results, and they can make the picture difficult to view. Try small changes first. You can compare your adjustment with the original picture using the Undo/Redo button, then click Accept when you’re happy with the results or click Cancel to go back to the original. This function lets you adjust the color of your 3D pictures. Click and drag the slider for Brightness, Contrast, Saturation, or Red/Green/Blue color levels. Use one of the Reset buttons to reset each value individually or reset all values together. Click Accept when you’re happy with the results, or click Cancel to go back to the original. This function saves the edited picture with the same file name and settings as the original. It is only available if edits have been made. The original file is overwritten, so only use this option if you’re sure the edited picture can replace the original. This function saves the currently displayed picture. With this option you can choose the file name, file type of MPO or JPS, image resolution, and JPEG quality. For larger pictures, multiple resolution options are presented so you can choose to scale the picture to yield a smaller image and file size. Only one resolution option is presented for smaller pictures. This cancels all edits you may have made and exits edit mode, going back to the normal viewing mode. You can share the 3D photos you created with 3DComposer in 3DMedia’s online 3D Photo Gallery at http://3dmedia.com/gallery/. Now that you’ve created some outstanding 3D pictures, you should share them with the world, or at least with family and friends! The following functions make sharing easy. They exist as buttons and can also be found in the Share menu. This function starts the process of uploading your 3D photos to the online gallery. You’ll need to create a gallery account if you haven’t already done so. Just follow the simple on-screen instructions. Note that your Username and Password also give you access to 3DMedia’s online user forum. Before sending your pictures, you are given another opportunity to add tags to them. Adding descriptive tags can help you and others find your pictures in the gallery. This function starts the process of viewing the 3D photos you have stored in the online gallery. It can also be accessed by pressing the My Gallery button from within the viewer. Just follow the on-screen instructions to log in and select the album you want to view. The 3D viewer starts a slideshow of all pictures in the album you choose. This opens the online gallery home page in your default web browser. You can upload and view your own pictures using functions above, but you still need to visit the website to look at other peoples’ 3D pictures. The file menu contains several file-related functions. Open the folder in Windows Explorer that contains the 2D Picture(s) shown in the thumbnail viewer. Open the folder in Windows Explorer that contains the 3D Picture(s) shown in the thumbnail viewer. This function allows you to add descriptive tags to the selected 3D pictures. These tags comply with the IPTC standard. Only the following tags are supported: Headline (title), Description, and Keywords. When multiple pictures are selected, the tag entry form automatically fills in any tags that are found to be empty with the existing tags from the previous picture in the selected group. This allows you to quickly apply the same tag to several pictures. Tagging 2D pictures is not supported. Delete the selected 2D picture file(s). If source pictures are selected, the associated 3D picture is NOT deleted. Delete the selected 3D picture file(s). If 2D source pictures exist for the 3D picture(s), they are NOT deleted. Select all pictures shown in the thumbnail viewer. Refresh the folder browser and thumbnail viewer. For example, this could be used in case you change folder or file names from outside 3DComposer, or connect or disconnect storage devices. Exit the program. If a viewer window is open, it must be exited separately. The preferences menu provides options for what you want to show in the browser window. Show Tool Bar: Enable/disable the tool bar (control panel buttons). Show Instruction Bar: Enable/disable the instruction bar (below the tool bar). The instruction bar can also be disabled by clicking the “Close” button on its left side. Show Status Bar: Enable/disable the status bar (at the bottom of the browser window). Small Thumbnails: Show small thumbnails in the thumbnail viewer. This is the default option. Medium Thumbnails: Show medium thumbnails in the thumbnail viewer. Large Thumbnails: Show large thumbnails in the thumbnail viewer. To create 3D photos from pictures taken with a standard 2D camera, you need to take two pictures of the same subject. Take the first picture, then move the camera a certain distance to the right and take the second picture. These two images, one left and one right, correspond to how our two eyes view the scene. Your brain uses differences in the two images to perceive the depth of objects in the scene and create a three dimensional view. The concept is very simple, however, there are some guidelines to follow to help you achieve the best results. When starting 3DComposer for the first time, a slideshow is presented that illustrates the fundamentals of taking 3D photographs. This slideshow can be replayed at any time by selecting the menu item Help -> How to Take 3D Photos. However, even more detailed information is provided below. Scenes where objects are at the same depth may not have a dramatic effect with 3D photography. 3DComposer requires that objects within the pictures are not moving. Scenes that contain moving objects yield left and right views that can be too different to create a stable 3D picture. For best results, avoid taking pictures of moving objects as the quality of the resulting 3D picture may be objectionable. 1. After taking the first picture, maintain the same focus when taking the second shot. Many cameras allow the focus to be maintained between shots by keeping the shutter button held down half way, the same way it can be held down half way to focus before shooting. With these cameras, you can take multiple pictures by fully pressing the shutter button multiple times without fully releasing it between shots. If focus from the first picture is not maintained, refocus the camera on the same subject as the first picture, but do not re-center the subject in the viewfinder when taking the picture. It shouldn’t usually be necessary, but using manual instead of automatic focus can solve any problems of maintaining focus. 2. Take both pictures with the same camera settings if possible. The only thing that should be different between the two shots is the camera position. Some cameras set all parameters (including focus) when you half-press the shutter button. With these cameras, you can take multiple pictures by fully pressing the shutter button multiple times without fully releasing the shutter between shots. 3. When sliding the camera between shots, don’t move the camera up or down, only to the right. 3DComposer can handle reasonable levels of vertical camera motion, but it must crop the non-overlapping parts of the two pictures, so such motion should be kept to a minimum. 4. When sliding the camera between shots, don’t re-center the subject within the camera viewfinder. You should move the camera directly to the right (see condition A in the figure below), and try to not to angle the camera in (condition B, called “toe-in”) or out (condition D, called “toe-out”). 3DComposer is able to successfully deal with reasonable levels of toe-in and toe-out that are typical of normal variations when taking two pictures. However, 3DComposer cannot create high-quality pictures with too much toe-in/out. If the toe-in is excessive (condition C), 3DComposer cannot create a 3D picture at all. The distance that you slide the camera between shots is called the stereoscopic base. Choosing an appropriate stereoscopic base is important for getting good results in 3D. Guidelines for determining this for a given scene are provided below. Note, however, that your measurements do not have to be very precise to create excellent 3D content. With a little practice you’ll develop a feel for it and be able to shoot great 3D content using your current cameras. The average distance between a person’s two eyes is about 2.5 inches (6-7 cm). Therefore, sliding the camera this distance between shots yields the most realistic 3D photographs in many cases. Although 2.5 inches (6-7 cm) should be considered the default stereoscopic base, in general, the best choice depends on the distance from the camera to the closest object in the scene it views. The following figure provides an overview which is discussed in more detail below. When photographing scenes where the closest object is less than 10 feet (3 meters) from the camera, it is best to reduce the stereoscopic base below 2.5 inches (6-7 cm). Note that the closest object in the scene is often not the main subject/focus of the picture, so the closest object should be carefully noted. The table below provides guidelines for selecting the stereoscopic base in these cases. When photographing scenes where the closest object is significantly more than 10 feet (3 meters) from the camera, it’s optional to increase the stereoscopic base beyond 2.5 inches (6-7 cm). The default distance yields natural results, but larger settings can be used to enhance the 3D effect for landscapes and other far away shots. Although calculations can be made, selection of the stereoscopic base in these cases tends to be more forgiving, and largely a matter of personal taste. However, again beware of closer objects that may not be your intended subject, as these should affect your decision. It is not required, but for those inclined to do more precise math, a more technical answer for calculating the stereoscopic base is as follows. When using typical cameras, most people tend to prefer using a stereoscopic base of between 1/30 and 1/60 of the distance to the closest object in the scene. For example, if the closest object is 5 feet away, a good stereoscopic base would be in the range of 1 to 2 inches, as calculated below. With 3D photography, the amount of depth in your pictures is determined by the stereoscopic base you choose. The guidelines provided above should serve as a baseline in order to create realistic 3D scenes. However, you may choose to alter the depth by deviating from these guidelines after you get comfortable with taking and viewing 3D photos. By increasing the stereoscopic base, you can make objects appear very close to the viewer (i.e., popping out of the screen). This creates a larger than normal perception of depth. Alternately, decreasing the stereoscopic base creates a smaller than normal perception of depth. Different people have different preferences for depth. The experience of depth also varies for different cameras, depending on the focal length, as well as for different displays. Therefore, over time, we recommend that you experiment with small variations in the stereoscopic base to find the ideal settings for you. Although it may be tempting to increase the 3D effect beyond our normal perception by using larger stereoscopic bases, note that creating pictures with a lot of depth and objects very close to the viewer can create discomfort or fatigue during viewing. Initially, it may not be easy to determine how far you are shifting the camera. In general, there is a tendency to shift much further than the determined stereoscopic base. It’s best to bear in mind that the distance between your eyes is typically about 2.5 inches (6-7 cm), and to realize that seemingly small shifts of the camera can still produce dramatic 3D pictures. For advanced 3D photographers experimenting with larger stereoscopic bases, there are two recommended methods to help perform the desired amount of camera shift and still maintain the balance needed to take good pictures. One method is to separate your feet the same distance as the desired binocular distance, then align your body and the camera over your left foot, take the first picture, then align your body and the camera over your right foot and take the second picture (see drawing A below). 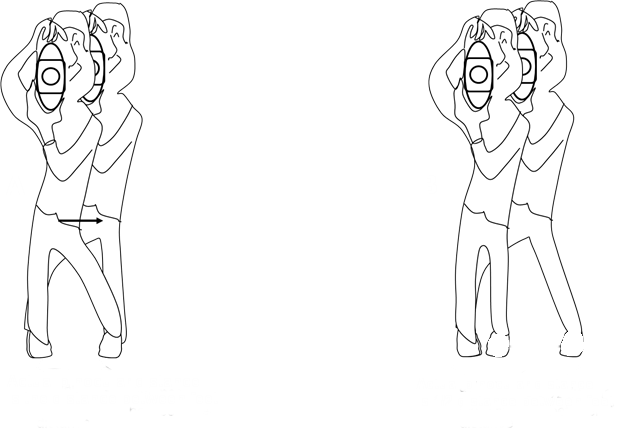 The second method is to place both feet together for the first picture, then extend your right foot by twice the desired binocular distance for the second picture while keeping your body and the camera centered over both feet for both shots (see drawing B below). Both methods work well for stereoscopic bases between 3 inches to 2 feet (7.5 cm to 0.6 m). WARNING: It is highly recommended to immerse yourself slowly into 3D viewing. Generating too much parallax can potentially cause eye strain and headaches, especially when viewing 3D content continuously for long periods of time. If eyestrain and/or headaches persist, discontinue viewing in 3D and consult a physician. The current version of 3DComposer cannot support nor recognize movement between objects, therefore it is recommended to only create pictures of static scenes and objects. If there is movement in a picture pair, the resulting 3D picture should not be extensively viewed and analyzed, instead it should be discarded. 3DMedia is working to develop more advanced technologies that compensate for moving objects to create outstanding 3D content even in scenes that include them. Windows and DirectX are trademarks or registered trademarks of Microsoft Corporation in the United States and/or other countries. 3D Vision is a trademark or registered trademark of NVIDIA Corporation in the United States and/or other countries. Viera is a trademark or registered trademark of Panasonic Corporation in the United States and/or other countries. Infinia and Optimus are trademarks or registered trademarks of LG Corporation in the United States and/or other countries. EVO is a trademark or registered trademark of HTC Corporation in the United States and/or other countries.